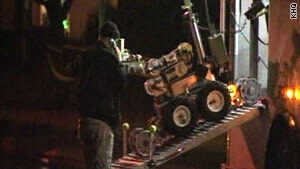 Police used a robot to remove explosives from John D. Raymond's Spokane Valley, Washington, apartment. (CNN) -- A residential building in Spokane Valley, Washington, was being decontaminated after police removed a half pound of highly sensitive explosives from one of the apartments, a sheriff's spokesman said. John D. Raymond, 53, is being held on a civil bench warrant and is likely to face charges in district court Tuesday of illegally manufacturing and possessing explosives, said Sgt. Dave Reagan of the Spokane County Sheriff's Office. Raymond uses a wheelchair to get around and lived in a ground floor apartment of the 10-unit building. He was transported to jail by ambulance, Reagan said. A police robot removed a half pound of TATP, or Triacetone Triperoxide, from Raymond's apartment, Reagan said. TATP is extremely sensitive to impact, temperature change and friction, according to the defense and military Web site GlobalSecurity.org. It has been used by suicide bombers in Israel and was chosen as a detonator in 2001 by the thwarted "shoe bomber" Richard Reid. The TATP in Raymond's apartment was placed in a bomb-proof container and taken to a county-owned gravel yard for detonation. "It is too unstable to save as evidence," Reagan said. A secondary sweep of the apartment did not turn up any more TATP, but authorities were concerned about material found in the kitchen sink. As a precaution, the Spokane Fire Department HazMat unit has been called in to decontaminate the scene before residents are allowed to return to their apartments. Reagan said Raymond was angry about how his divorce case was being handled.